Q: How do I get a list of items that I've checked out previously? To protect patron privacy and confidentiality, we do not keep a history of items that patrons have checked out. Once you return an item, its record is cleared from your account. The only exception is if the item has incurred a fine or fee, in which case the title is associated with the bill until the bill has been cleared from your account. You do have the option to keep track of your items on your own through your account in our web catalog. Log in: Log in with your Library card number and 4-digit PIN. Find your item: Go to My Library to see checked out items or you can search the catalog. 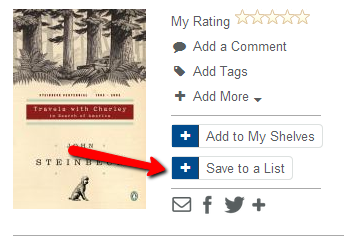 Add it to a shelf: For each item, select the option that says Add to My Shelves. You can choose to categorize it as Completed, In Progress or For Later.